With a pole and a bit of paint, you can make colorful stripes on a barber pole. 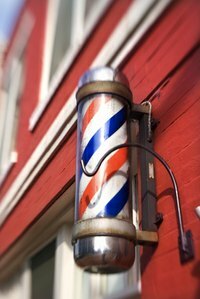 Barber poles can have red stripes or red and blue alternating stripes. The stripes on the pole have an important significance. Red stripes represent the blood work that barbers would perform in ancient times when a barber would also work as a surgeon. Blue stripes were later added in to represent a body's veins. Start at the top of the pole with the painter's masking tape. Use 2-inch tape if you are only placing red stripes on the pole. If you are adding blue stripes, apply 1-inch tape. Place the tape at a 45-degree angle as you wrap it around the pole. Measure 1-inch space between each spiral of tape for the red and blue stripes, or a 2-inch space for just the red stripes. Pop the lid off the red can of paint using a screwdriver. Place a stirring stick in the paint and mix thoroughly. Dip the paintbrush into the red paint. Paint in the spaces between the tape. Add the blue color between the stripes of red to create the alternating effect. Allow the paint to dry. Slowly pull the tape off the pole to reveal the white stripes between the red and blue paint stripes. Based on how thin the pole material is, you can add lighting inside to illuminate the pole at night. You can also attach a motor to make the pole spin, giving the illusion of the moving stripes.